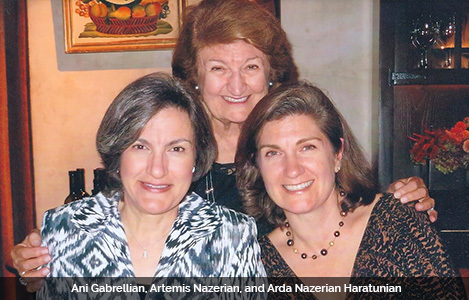 In 2015, University Trustee Ani Gabrellian ’84, with her husband, Mark Gabrellian ’79, established the Hagop and Artemis Nazerian Humanities Lectures in honor of Ani’s parents. Recently, Ani sat down with her mother, Artemis, to talk about the importance of the humanities, what they mean to their family, and much more. Ani Gabrellian: A 2013 article in The Atlantic about immigration and art stated: The experience of touching down in a totally foreign place is like having a blank canvas: You begin with nothing, but stroke-by-stroke you build a life. This process requires everything great art requires—risk-tasking, hope, a great deal of imagination, all the qualities that are the building blocks of art. You must be able to dream something nearly impossible and toil to bring it into existence. What do you think about this statement? Does this reflect your experience? Artemis Nazerian: The second I read this I thought of landing at Idlewild Airport, now Kennedy, in New York as a student with one suitcase. I remembered John Locke’s philosophy of “tabula rasa”—being born with a blank slate. I was full of questions, ambitions and fear—especially fear of the unknown. I remembered the values my parents instilled in me and I recalled my upbringing. My parents stressed an interest in learning and an underlying respect for those around me. Now I had to put these values to good use. My brother picked me up and drove me to Putney, Vt., to start my graduate work in teacher education. It included a 10,000-mile study tour with no one I knew and nowhere I had ever been. I felt a nervous excitement and considered this moment my second rebirth. I had been taught that you can fool others at times but you can never be happy when you fool yourself. So, I picked up my easel and my brush and promised to be true to myself. Today, I’m grateful that my “canvas” has been filled as it has—not always easy, not always pain-free. And now I see how you and Mark, together with the University of Rochester, have added the newest stroke to that canvas. AG: Where did your passion for literature, music, and history come from? AN: It started at home. My parents were uprooted twice—first because of the Hamidian Massacres in 1895 and then the Armenian Genocide of 1915 after which they started to rebuild their life together. They valued the importance of multicultural education and learning different languages. In elementary school in Beirut, Lebanon, we learned to speak, read, and write in four languages: Armenian because it was “our” language and we used it at home; French because in those years Lebanon was a French mandate and it was the official language; Arabic because it was the language of the Lebanese people; and English because to get a good education you either went to the American University of Beirut (AUB) or the French university. We had no TV and the use of radio was limited. My dad decided when to turn it on and off. Before going to bed every night, my dad would tell us one of Aesop’s Fables. We would hear these stories over and over and we loved it. Then he would test us. What was the moral of this fable? We would talk. We weren’t allowed to use the word “bored”; my mom would say just change what you’re doing and you’ll be fine. My parents stressed the value of learning languages because they said we could become as many people as the languages we spoke. My sister and I would have fun with this—we would pretend to be a little French girl or an English girl. We all took music lessons because it refined our souls. We were taken to lectures to hear a “smart person” speak. For example, we went to the British embassy to hear the historian Arnold Toynbee speak. Unfortunately, I didn’t learn much from that speech because I was learning American English and he had a British accent. I will never forget when, as a 14-year-old at the American School for Girls, I heard Helen Keller speak. I still remember her powerful message that the worst thing in life, worse than being deaf or blind, was not having vision. She said you can see with your heart and hear with your soul. These were beautiful humanitarian concepts discussed by our parents and teachers. My dad would say that by educating his daughters he was educating a family. So this is where it all started … in the home, and it hasn’t stopped. Today, I can’t go anywhere without my iPad. I find myself googling new words or concepts, or looking for articles that interest me. That may be the extent of my technological skills but it’s more than enough to continue learning and keeping up with current events, which I think is so important. AG: My father, Hagop, was an avid traveler. Where did this interest come from and why was it important for you (both) to expose my sister and me to travel at an early age? AN: Hagop loved travel and insisted that you and your sister, Arda, start traveling from a very young age—first and most importantly to visit our extended families in places like Jerusalem, Beirut, Cairo, and, of course, Armenia. Travel across America was also important. Your father felt—we both did—that travel is sometimes the best education … about history, diverse cultures, art, even food. I know Hagop was extremely proud of his father’s joining the French Legion during World War I. He was, in fact, one of the heroes of the Battle of Arara, which some considered a decisive battle in the Middle East against the Ottoman forces that had just perpetrated the first genocide of the 20th century against his own Armenian people. Hagop knew firsthand from his father’s stories and experiences how big and complicated the world was, and he decided he wanted to see it all—or as much of it as he could. So before he arrived in the United States, with dreams of getting a good education and starting a new life, your father traveled to dozens of countries. He even documented his travels using his own artistic skills, creating a graphic record of his “trip around the world” that included each country’s name, flag, mileage traveled, and information on each destination. Our grandson, Armen, is the proud keeper of that document now. I’m so happy that you, Arda, and all our grandchildren seem to have caught this travel bug, and it sometimes saddens me that Hagop wasn’t able to enjoy these experiences with his grandchildren. AG: Why was it important for you to expose Arda and me to the arts and how do you think we benefited from the experience? AN: I saw the impact and value of the arts on my life and knew it would add an important dimension to yours. All my children and grandchildren have been exposed to the arts, each playing musical instruments and developing their individual interests in the fine arts—taking classes, experimenting with different types of art, and visiting museums wherever they travel. Although none of you have pursued professional careers in these fields, it certainly has made all of you more interesting people who have an appreciation for opportunities to continue exploring and enjoying the arts. AG: What do you hope students and faculty at Rochester are able to take away from the newly created Hagop and Artemis Nazerian Humanities Lectures? AN: I hope through the humanities lectures the students will develop some insightful thinking and the art of questioning. I hope they will develop a thirst and interest in exploring different cultures because the world is shrinking and students will need to appreciate this evolving dynamic for their own benefit, regardless of the careers they pursue. For faculty, I hope they welcome the opportunity to challenge themselves by exploring and discussing interesting and timely topics related to their areas of expertise. This reminds me of a profound life lesson. As sophomores at AUB with vastly different majors, my classmates and I bemoaned having to take several required courses in what today would be considered the humanities. We studied the history of cultures and civilizations through lectures and more importantly, followed through with small discussion groups. Today we are teachers, doctors, engineers, and musicians, and when we see each other, we smile and agree that those courses were a high point of our university education and they built a positive and powerful foundation for our careers and social lives. On behalf of your father and me, I say a big thank you for this program that will allow so many more students to learn how to fill their own canvases, just as I hope the same for our grandchildren.